Make It GRAND! (DVD-03) Personalizing Grand Entrances By Peter Merry In September of 2004, while serving as the National ADJA President, Peter Merry presented this hour long seminar on Grand Entrances. 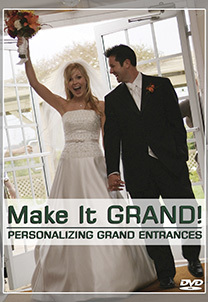 This was the first time his proprietary methods for creating uniquely personalized Grand Entrances were divulged in vivid detail. The Grand Entrance is every wedding entertainers first opportunity to showcase their talents in an effort to set the tone for what should prove to be an unforgettably fun celebration. With this DVD, you will learn several different proven methods for creating Grand Entrances that are highly energetic and creatively entertaining. When these ideas are used effectively, you will see a noticeable increase in the number of guests who will be asking for your business cards well before the open dancing has even begun. So lets Make It GRAND!